Wedding organization is crucial if you want to avoid the stress and worries that many brides feel for months before the big day. In fact, to avoid the pressure many brides-to-be feel in the weeks right before the wedding, get as much as possible done months ahead of time. This will allow you to feel excited those last couple of weeks before the wedding takes place, instead of anxious. In nearly every wedding, something will go wrong. That’s a given. Although it is usually a small glitch, you can avoid huge blunders (and many tears) by preparing ahead of time. Bask in the glow of your engagement for a week or two, then get busy! You will be glad you did when your special day arrives. 1. If you don’t have one already get a calendar or datebook. In this datebook, list specific dates that you want to have things completed. Mark the date that you want to reserve the wedding location, the date you will start organizing meetings with caterers, etc. This book will be such a helpful tool as you organize your wedding. 2. 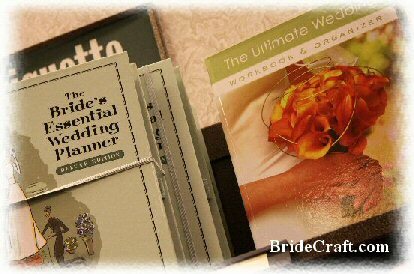 Buy or make a wedding planner! Treat this book as if it is worth a million dollars, because it will save you a lot of grief! In this wedding planner, you will keep everything from receipts, photo's, contracts, pricing information, emails, etc. You will want to have special sections in the book for each area you must organize - catering, photography, entertainment, flowers, and so on. Be sure to set the book up so that important receipts cannot easily slip out of the pages. And an absolute MUST is to include your name and phone number in the book, in case it is lost. I have experienced this first hand when planning a wedding. Thankfully, the person who found the book saw the phone number inside and called it. We were reunited with the planning book. Contact info can be a life saver. Some great store bought options exist that may even include reminders for things you never even considered. Even if you intend to create your own organizer, you should check out some of the awesome books available to get an idea of what will be useful. 3. Share some of the wedding organization with your honey! You can keep your wedding organized by discussing and sharing what needs to be done. It will also make him feel a part of the planning process, more involved and more connected. And knowing that there is someone else helping with all of the preparations will help you to control common wedding planning stresses. Remember not to overwhelm your other half, and assign him to sections of the wedding that you know he will enjoy taking care of. 4. Be flexible. If the groom has different ideas about a few things, give a little. It's almost a guarantee that both of you won't want exactly the same things (food, beverages, etc), so be flexible. This isn't the time to start having heated arguments! Always try to get feedback on important decisions, and truly listen when a problem arises. Believe it or not, coming to an agreement about certain aspects early on will help you to keep your plans organized by avoiding confusion. 5. Create a timeline! Once all of the major decisions about “who’s doing what” have been made, make at least a rough time line of the events of the day. An important thing to include on this timeline should be your vendor names, contact phone numbers, and delivery and set up times. Provide any heads of catering, event coordinators, day-of-planners, etc with a copy. This will help to lay your hard work out to help support a smooth wedding day. Others may see that your cake did not show up at 3 as expected, and may be able to make the phone call to double check on its status. Or your caterer and your florist will be able to quickly see a scheduling conflict for loading, and resolve it in advance. Even a rough timeline will help to create a stress free event for all. 6. Keep visual aids! Photos of your gown (carefully hidden from your Groom), bridesmaids gowns, fabric swatches, linen samples, paint color chips, etc, will be incredibly helpful to you when meeting with your vendors. These will be for vendors’ use in helping to visualize the event that you desire and making sure that there are no communication blunders. Follow some of these wedding organization tips to help you plan out your day. Wedding organization may be the most important thing you can do to ensure you avoid lots of anxiety and stress, and enjoy a memorable and exciting day full of love, laughter and beauty. Return Wedding Organization to Wedding Article Library.